“Quality is never an accident. It is always the result of high intention, sincere effort, intelligent direction, and skillful execution; it represents the wise choice of many alternatives”. It was a pleasure working with Mike Lever. He helped me out with multiple projects at once and did an excellent job coordinating the job to completion. He had all the attributes one looks for in a contractor, and I would most certainly enlist him into future projects and recommend him to anyone looking to complete a home project/repair. My kitchen was in a need of some updating. It was mostly dark granite counter tops. Very stuck in the 90s. 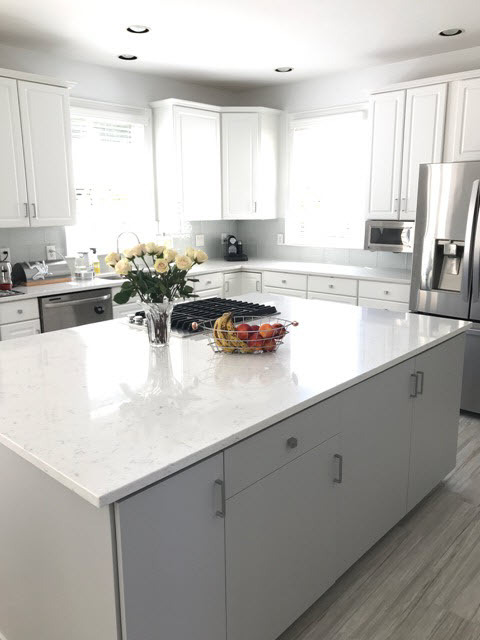 We changed the counter tops to quartz and rebuilt the island from scratch. It is so much bigger and brighter. It's also more user-friendly as I have so much more space to cook. I am extremely pleased with the work and love my new kitchen. It was a true pleasure working with Mr. Lever on the remodeling of our garage and workshop/studio space. This work involved insulation, electric, plumbing, HVAC, painting, drywall, and some concrete work. Throughout it all, Mike was honest, courteous, professional, on time, and a good communicator. The quality of work performed was outstanding. We are very pleased with how the project turned out. I wouldn't hesitate to work with Mr. Lever again and highly recommend him to others. Thank you, Mike, for making the whole remodeling process as smooth and enjoyable as possible! © 2018 Supreme Renovations. All Rights Reserved.